Rotary Club of Koronadal presents Halloween Run 2012! Halloween fever is here! From halloween decorations displayed in shopping malls to cosplay and "Trick or Treat" events organized in restos, hotels and shops in the province, no doubt Halloween fever has hit South Cotabato! 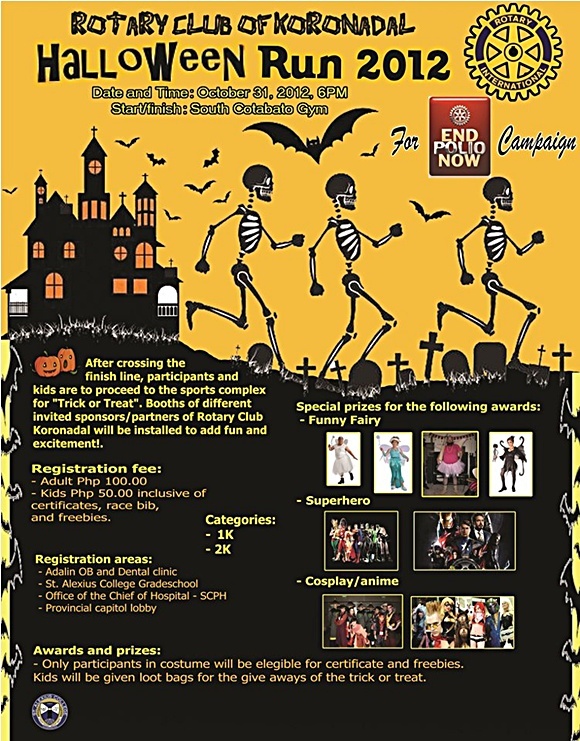 And here's another event for a good cause - Rotary Club of Koronadal invites everyone to join the HALLOWEEN RUN 2012! A not-your-usual fun run event organized by the Rotary Club of Koronadal in support to Rotary International's "End Polio Now" campaign. Check out the poster below for more details. The Halloween Run 2012 will be held on October 31, 2012 6PM at the South Cotabato Gymnasium and Cultural Center. For registration and other inquiries, visit the registration areas located at the Adalin OB and Dental Clinic, St. Alexius College - Gradeschool, Office of the Chief of Hospital -South Cotabato Provincial Hospital and at the lobby of the Provincial Capitol.